Tra Chang fish sauce is the best fish sauce we've ever tasted, and now we've imported the highest quality shrimp paste from Tra Chang. Made using the finest shrimp, packed in the most hygenic conditions. See our photo tour, filmed at Tra Chang, showing how shrimp paste is made. 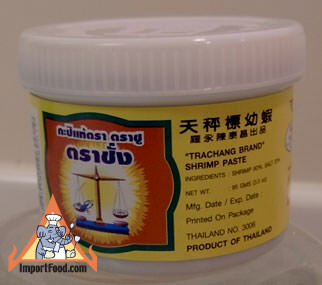 Our Tra Chang shrimp paste is extremely fresh, as it was just packed and shipped to us. This is the best shrimp paste you will ever taste. A key ingredient in authentic Thai recipes listed below, shrimp paste is made from fresh shrimp and salt. A strong-smelling and very important element of all kinds of Thai curry paste. You'll love it in gaeng hanglay. Packed in convenient plastic tub with tighly sealed lid. This is a convenient size (3.3 oz), not a large container but will last a long time. Ingredients: shrimp 80%, salt 20%. Product of Thailand. Watch our feature "Shrimp Paste used to make Prik Pao"
In our continuing effort to present regional Thai recipes, here is an authentic version of Gaeng Hanglay, a northern Thai curry made with pork (or beef). Similar to massaman but without the coconut milk. The main ingredient is pork, and you can use a fatty belly pork or other cut of your choice. Other distinctive ingredients are ginger and pickled garlic. Some recipes call for Santol fruit (wild mangosteen) or pineapple cut into large cubes. We used fresh pineapple with good results. This dish originated from Burma, and in Burma this is usually served with Khai bananas (small bananas). You will usually find gaeng hanglay served in Khantok-style Thai dinners as one of the main dishes, together with sticky rice. As opposed to tom jabchai, this *is* a vegetarian dish. Though normally included in Thailand, the curry paste and chili beans in oil can be considered optional for those who are looking for something with a little less heat. You can use any vegtables available, but typically in Thailand it would be made from a gourd. If one of the gourds is used it is cut into bite sized chunks first. We now offer an instant kaeng liang mix. This recipe was featured in the October 2008 issue of Saveur Magazine, which is one of the most beautiful isues of a cooking magazine ever published. We already love Saveur but their Breakfast Issue of October 2008, featuring breakfast served around the world, was spectacular. We were so pleased to be featured as a supplier for the ingredients necessary to make Sayur Lodeh, a Singaporean vegetable curry. Sayur Lodeh takes awhile to prepare, at least 1 hour, so be patient. It has an excellent aroma, and the final result is very rich and full of creamy, healthy, herbal flavor. The candlenuts add a wonderful nutty flavor. The chile peppers gives it a nice spicy edge also. In Singapore this dish is often served for breakfast with toasted coconut, sambal, and steamed jasmine rice. After serving sayur lodeh, we added a few drops of soy sauce to each dish for a nice added seasoning. Saveur states that this serves four but we think it's more like an 8 person serving size, with jasmine rice. This is a 'Thai-ised' version of a recipe from Delia Smith's cooking course, called Chicken with Whole Spice, which is a mild pastiche on Indian food. This version is set up for a slow-crock cooker, but it could be prepared as a conventional casserole by simmering it on the stove top for about 30 minutes or in an oven at about 180 C for 30 minutes or so. Traditionally this is prepared with the fish known in the West as a pomfret, but any similar (flat) fish will do. This is steamed, and as such is best done in a bamboo steamer, because in a metal steamer condensation on the lid drips onto the food and marks it, spoiling the appearance and also possibly affecting the cooking process (fish is best steamed in "dry" steam). If you use a metal steamer you should cover the fish with a paper towel which is not in direct (or limited) contact with the steamer. Alternatively you can cook this dish in a microwave, using low to medium power. Clean the fish and score the sides with several cuts to allow the marinade to penetrate. This is another simple traditional treatment for fish: this time it is deep fried. The recipe includes some minced pork: this can easily be omitted. It is included in this case only to reproduce the traditional taste, as in the past this dish was deep fried in pork fat, which transferred the pork flavor to the fish. Today it would more typically be fried in vegetable oil, hence the small quantity of pork. The fish is normally fried with the head on. You need a small-to-medium flat fish (pomfret, flounder, ...), cleaned and with the sides slashed for the marinade to penetrate.